The Super Bowl turned into a brand showcase for Fiat Chrysler Automobiles. 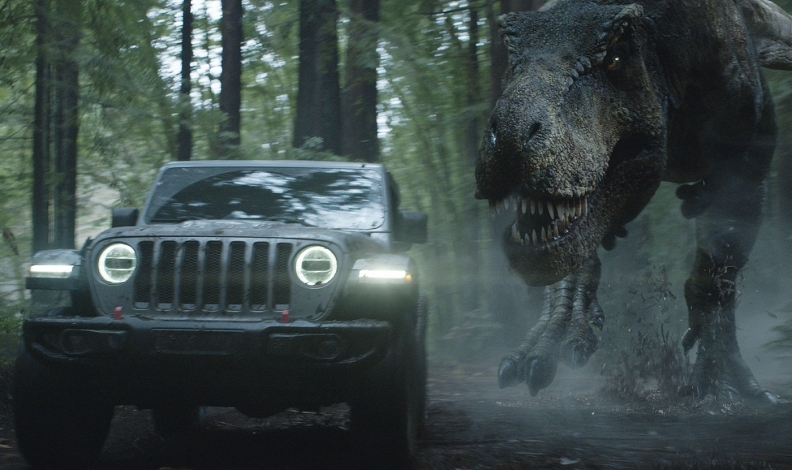 FCA’s collection of five spots for the Jeep and Ram brands had it all: A voiceover from Martin Luther King Jr., a nod to Jurassic Park and brash Vikings. But underneath the flashy veneer and inspirational messaging, it was clear FCA was looking to move metal. The brand focused intently on building awareness for the 2018 Jeep Wrangler and 2019 Cherokee along with the 2019 Ram 1500. FCA has a proud record of attention-grabbing ads, including the gritty "Halftime in America" spot starring Clint Eastwood in 2012 and the "Born of Fire" two-minute ad in 2011 that featured rapper Eminem. FCA’s vehicle-heavy approach differed drastically from Hyundai’s heart-tugging stunt using “hope detectors,” or Toyota’s attempt to present itself as a mobility company. FCA’s first spot, “Icelandic Vikings,” was a comedic showcase for the new 1500. It was laced with an up-tempo cut of “We Will Rock You." The next spot, the 30-second “The Road,” centered on the Cherokee, which the automaker says has a more premium design while retaining the 4X4 credentials of a Jeep. “The Road quietly draws an interesting parallel between roads and the idea of operating within someone else’s expectations,” FCA said in a statement. FCA’s aforementioned third spot featured King. The 60-second spot -- criticized by some on social media as appropriating the civil rights leader's words for commercial gain -- was handled by Highdive, a new boutique ad agency in Chicago. FCA’s fourth spot jumped back to Jeep. The 60-second spot, “Jeep Jurassic,” brings back Jurrassic Park star Jeff Goldblum for a rousing dino chase in the Wrangler. Later in the ad, Goldblum turns the tables on the T-Rex and begins chasing it in the Wrangler before popping out of a daydream. The spot was directed by Jurassic World director Colin Trevorrow, who returns as co-writer and executive producer of the upcoming Jurassic World: Fallen Kingdom. FCA’s fifth spot, another Jeep ad, was the simplest of the bunch. The 30-second ad, “Anti-Manifesto,” showed the Wrangler flexing its off-road chops with no music or special effects. The Olympics may have drawn some advertising dollars from the Super Bowl. Ford ran a Super Bowl spot last year, but is bypassing the game this time around even though it has the freshly launched EcoSport crossover to hawk. The automaker will instead run EcoSport ads during the Winter Olymics broadcasts on NBC. Chevrolet is attaching itself to the Olympics, too. General Motors or one of its brands has been an official sponsor or partner of the Olympics several times since the 1980s. While not an official partner in recent years, Chevrolet has been especially prominent during both the summer and winter games. It last appeared during the Super Bowl in 2015 with a spot just before kickoff that simulated a blackout. Toyota did a double-dip to support its major investment in a global Olympics sponsorship as official mobility partner. It ran three Super Bowl commercials, two of which centered on the company's sponsorship of the Winter Olympics and Paralympic Games. Other brands such as Audi, Buick and Honda said their product cadences simply didn't line up with a Super Bowl promotion. Buick made its Super Bowl debut in 2016 and returned for another round in 2017 with a spot featuring Carolina Panthers quarterback Cam Newton. "Advertising in the Super Bowl served Buick well the past two years when the timing worked with the brand's business objectives and campaign storytelling," Buick said in an emailed statement to Automotive News. "However, every year we re-evaluate all media spending, including Super Bowl, and make media placement decisions based on our business priorities, product lifecycles, and planned advertising campaigns." Buick says the brand will focus on "continuing the momentum" throughout the year around the recently launched Buick Enclave and building enthusiasm for the new Regal lineup, including the Regal Sportback, Regal TourX and Regal GS. Audi told Ad Age, a sibling publication of Automotive News, that it is focusing its "marketing efforts later in the year when our new models reach the market." A Honda spokeswoman told Automotive News that the Super Bowl "didn't align well with the timing of our product launch activities." Hyundai isn't pushing metal during the game this year. Dean Evans, the brand's chief marketing officer, said there's plenty of time to do that throughout the year. Instead, he said, Hyundai wants to use the Super Bowl platform to relay a more impactful message to the world. The automaker highlighted its Hyundai Hope on Wheels initiative, which is focused on finding a cure for pediatric cancers. The 60-second spot aired in the fourth quarter. Brands can leave a lasting impression with viewers without hawking products, said Steven Sottile, president of Unruly, an ad tech company. He pointed to last year's Hyundai's spot, where the brand reunited U.S. soldiers stationed in Zagan, Poland, with their families using 360-degree virtual-reality pods. "We've seen it time and again. We saw it last year with Hyundai. It's going to spark the interest to research more to find out more and really raise the profile of the brand to one that is committed to bettering the lives of Americans," Sottile told Automotive News. During the pregame show, Hyundai ran an ad to pitch the upcoming Kona, its first subcompact crossover. Hyundai is the official automotive sponsor of the NFL. Kia went back to its celebrity strategy for its ad. The spot featured the 2018 Stinger sport sedan, and star Brazilian racing icon Emerson Fittipaldi and Aerosmith rocker Steven Tyler. The commercial was supervised by "Born of Fire" author Saad Chehab, vice president of marketing and communications, who parted ways with Fiat Chrysler in 2015 and joined Kia Motors America in May. Lexus is drawing on its alignment with Marvel superhero film "Black Panther" in a spot showcasing the LS 500 F Sport and LC 500. A risk is that the cars could be overshadowed by the film connection. "That's always a risk when you're aligning with a major event like a movie release," Sottile said. "What will be interesting is if consumers make the connection between Lexus and the trailer itself." Toyota attempted to define itself as a mobility company in one ad, while chronicling the determination of Canadian Paralympic skier Lauren Woolstencroft in another. The Woolstencroft spot continued Toyota's "Start Your Impossible" Olympics campaign. The Toyota campaign illustrates how automakers can communicate the idea of mobility to consumers in a creative way, said Mike Bernacchi, a marketing professor at the University of Detroit Mercy. "Mobility is an important message," he said. "I like the idea of not just rolling a lineup of cars out." Toyota's third ad, "One Team," showed how sports can foster unity between people of various backgrounds and religions. A crew of religious figures hop in a Tundra pickup and head to a football game in the ad. The third spot, released on Saturday, is part of Toyota's longtime "Let's Go Places" U.S. ad campaign. This is the first time Toyota has run three primetime Super Bowl ads.